The World Inequality Report 2018 relies on a cutting-edge methodology to ­measure income and wealth inequality in a systematic and transparent manner. By developing this report, the World Inequality Lab seeks to fill a democratic gap and to equip various actors of society with the necessary facts to engage in informed public debates on inequality. The objective of the World Inequality Report 2018 is to contribute to a more informed global democratic debate on economic inequality by bringing the latest and most complete data to the public discussion. Economic inequality is widespread and to some extent inevitable. It is our belief, however, that if rising inequality is not properly monitored and addressed, it can lead to various sorts of political, economic, and social catastrophes. Our objective is not to bring everyone into agreement regarding inequality; this will never happen, for the simple reason that no single scientific truth exists about the ideal level of inequality, let alone the most socially desirable mix of policies and institutions to achieve this level. Ultimately, it is up to public deliberation, and political institutions and their processes to make these difficult decisions. But this deliberative process requires more rigorous and transparent information on income and wealth. To equip citizens to make such decisions, we also seek to relate macroeconomic phenomenon—such as nationalization and privatization policies, capital accumulation, and the evolution of public debt—to microeconomic trends in inequality focused on individuals’ earnings and government transfers, personal wealth, and debt. Reconciling macro and microeconomic inequality data is not a straightforward exercise given that many countries do not publicly release, or may not even produce, detailed and consistent income and wealth inequality statistics. Standard measures of inequality often rely on household surveys, which routinely underestimate the income and wealth of individuals at the top of the social ladder. To overcome current limitations, we rely on a groundbreaking methodology which combines in a systematic and transparent manner all data sources at our disposal: national income and wealth accounts (including, when possible, offshore wealth estimates); household income and wealth surveys; fiscal data coming from taxes on income; inheritance and wealth data (when they exist); and wealth rankings. The series presented in this report rely on the collective efforts of more than a hundred researchers, covering all continents, who contribute to the WID.world database. All the data are available online on wir2018.wid.world and are fully reproducible, allowing anyone to perform their own analysis and make up their own mind about inequality. Inequality within world regions varies greatly. 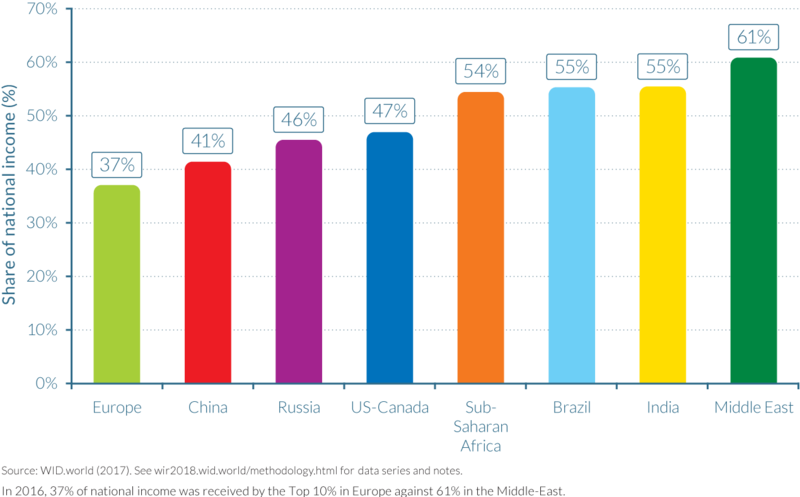 In 2016, the share of total national income accounted for by just that nation’s top 10% earners (top 10% income share) was 37% in Europe, 41% in China, 46% in Russia, 47% in US-Canada, and around 55% in sub-Saharan Africa, Brazil, and India. In the Middle East, the world’s most unequal region according to our estimates, the top 10% capture 61% of national income (Figure E1). 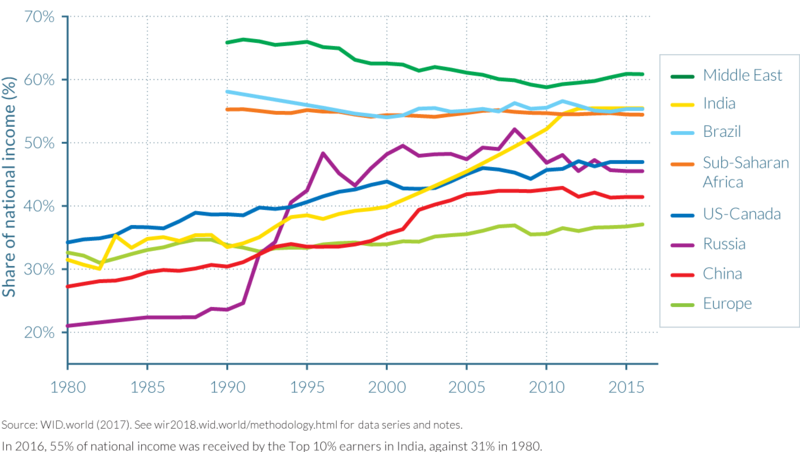 Top 10% income shares across the world, 1980–2016: Is world inequality moving towards the high-inequality frontier? The poorest half of the global population has seen its income grow significantly thanks to high growth in Asia (particularly in China and India). 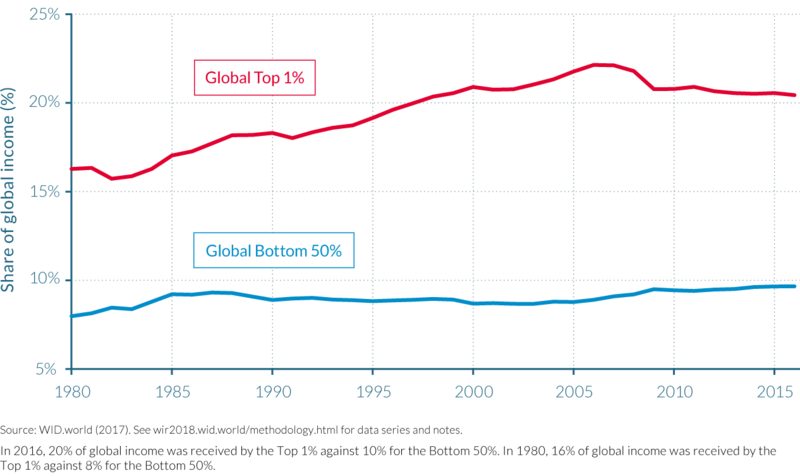 However, because of high and rising inequality within countries, the top 1% richest individuals in the world captured twice as much growth as the bottom 50% individuals since 1980 (Figure E4). 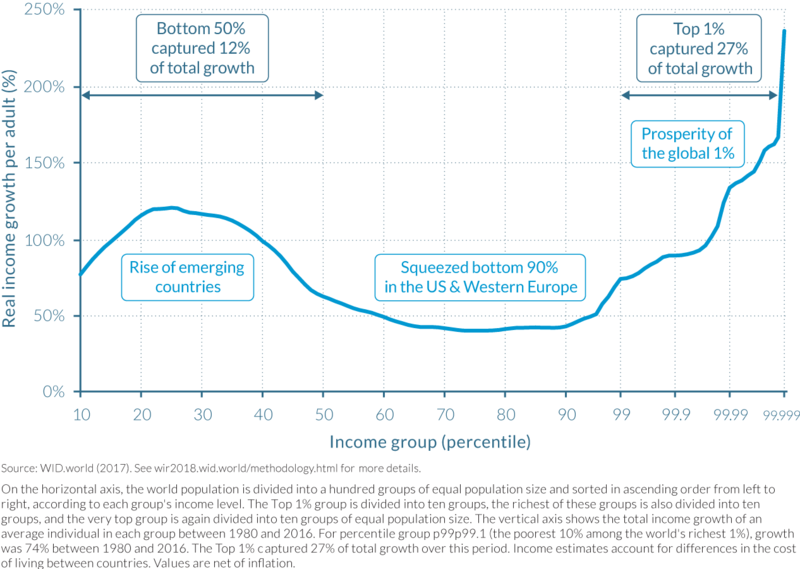 Income growth has been sluggish or even zero for individuals with incomes between the global bottom 50% and top 1% groups. This includes all North American and European lower- and middle-income groups. III. Why does the evolution of private and public capital ownership matter for inequality? There has been a general rise in net private wealth in recent decades, from 200–350% of national income in most rich countries in 1970 to 400–700% today. This was largely unaffected by the 2008 financial crisis, or by the asset price bubbles seen in some countries such as Japan and Spain (Figure E6). In China and Russia there have been unusually large increases in private wealth; following their transitions from communist- to capitalist-oriented economies, they saw it quadruple and triple, respectively. 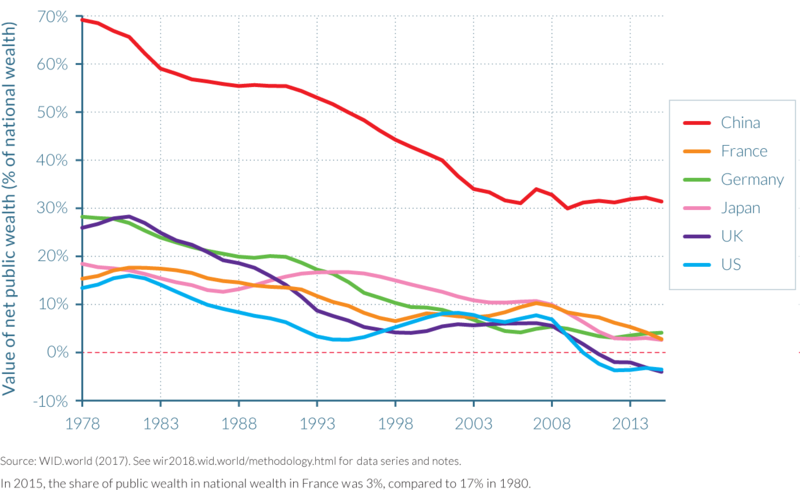 Private wealth–income ratios in these countries are approaching levels observed in France, the UK, and the United States. 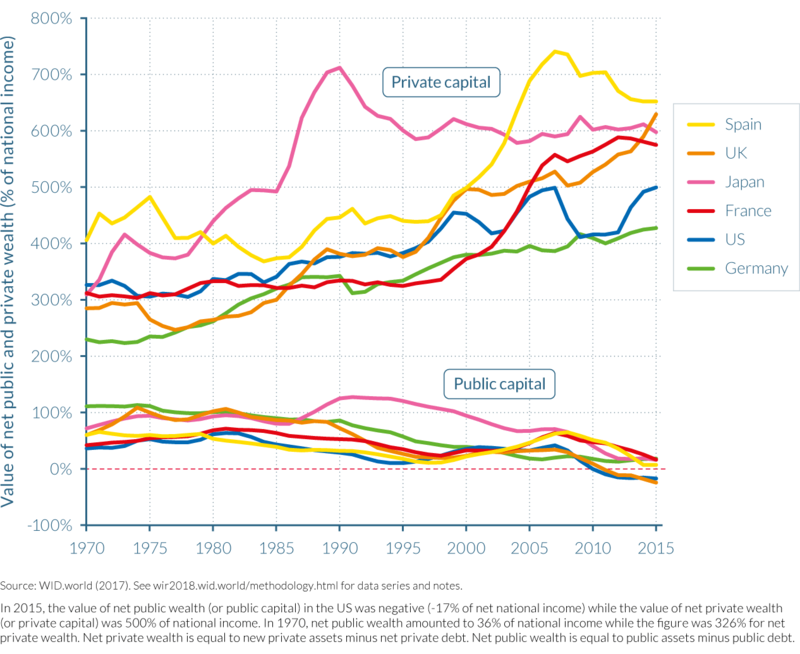 Conversely, net public wealth (that is, public assets minus public debts) has declined in nearly all countries since the 1980s. 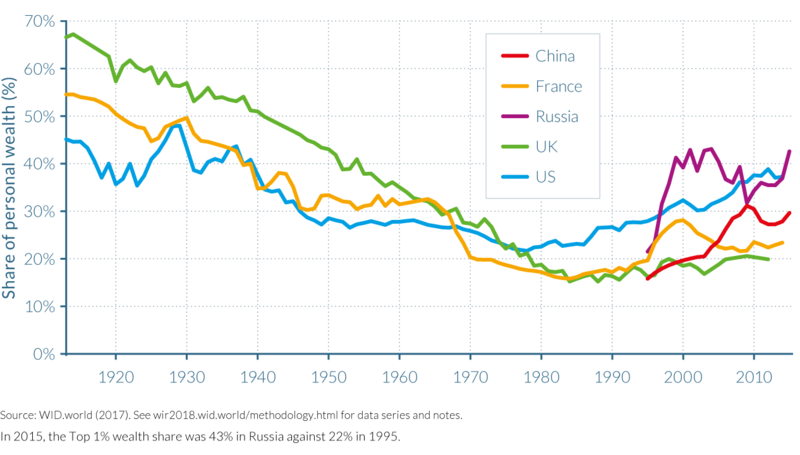 In China and Russia, public wealth declined from 60–70% of national wealth to 20–30%. Net public wealth has even become negative in recent years in the United States and the UK, and is only slightly positive in Japan, Germany, and France (Figure E7). This arguably limits government ability to regulate the economy, redistribute income, and mitigate rising inequality. The only exceptions to the general decline in public property are oil-rich countries with large sovereign wealth funds, such as Norway. IV. What are our new findings on global wealth inequality? 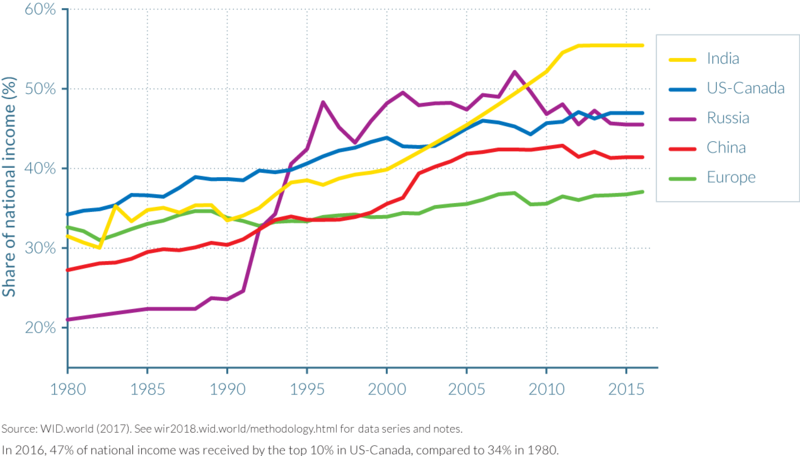 Wealth inequality among individuals has increased at different speeds across countries since 1980. Increasing income inequality and the large transfers of public to private wealth occurring over the past forty years have yielded rising wealth inequality among individuals. Wealth inequality has not, however, yet reached its early-twentieth-century levels in Europe or in the United States. Large rises in top-wealth shares have also been experienced in China and Russia following their transitions from communism to more capitalist economies. The top 1% wealth share doubled in both China and Russia between 1995 and 2015, from 15% to 30% and from 22% to 43%, respectively. V. What is the future of global inequality and how should it be tackled? We project income and wealth inequality up to 2050 under different scenarios. In a future in which “business as usual” continues, global inequality will ­further increase. Alternatively, if in the coming decades all countries follow the moderate inequality trajectory of Europe over the past decades, global income ­inequality can be reduced—in which case there can also be substantial progress in eradicating global poverty. Rising wealth inequality within countries has helped to spur increases in global wealth inequality. If we assume the world trend to be captured by the combined experience of China, Europe and the United States, the wealth share of the world’s top 1% wealthiest people increased from 28% to 33%, while the share commanded by the bottom 75% oscillated around 10% between 1980 and 2016. 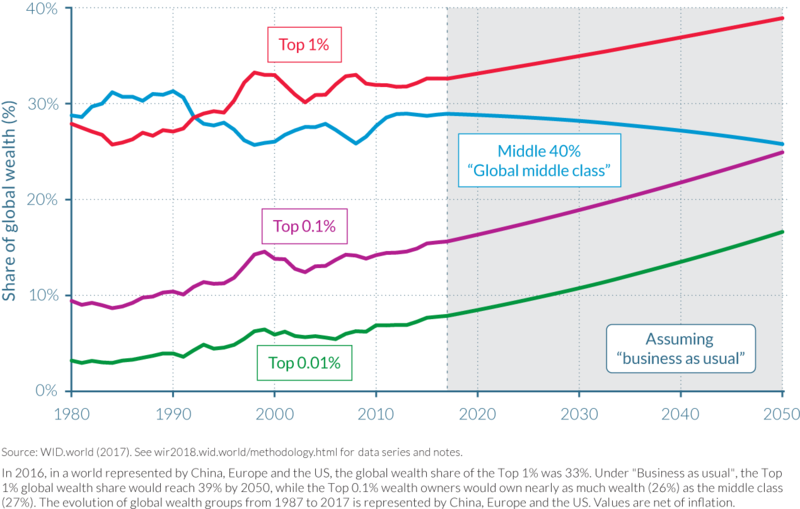 The continuation of past wealth-inequality trends will see the wealth share of the top 0.1% global wealth owners (in a world represented by China, the EU, and the United States) catch up with the share of the global wealth middle class by 2050 (Figure E9). Global income inequality will also increase under a “business as usual” scenario, even with optimistic growth assumptions in emerging countries. This is not inevitable, however. 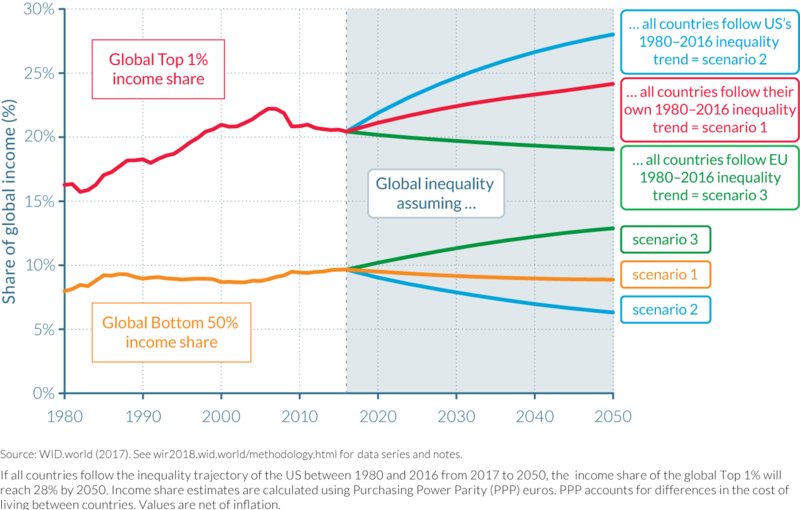 Global income inequality will also increase if countries prolong the income inequality path they have been on since 1980—even with relatively high income growth predictions in Africa, Latin America, and Asia in the coming three decades. 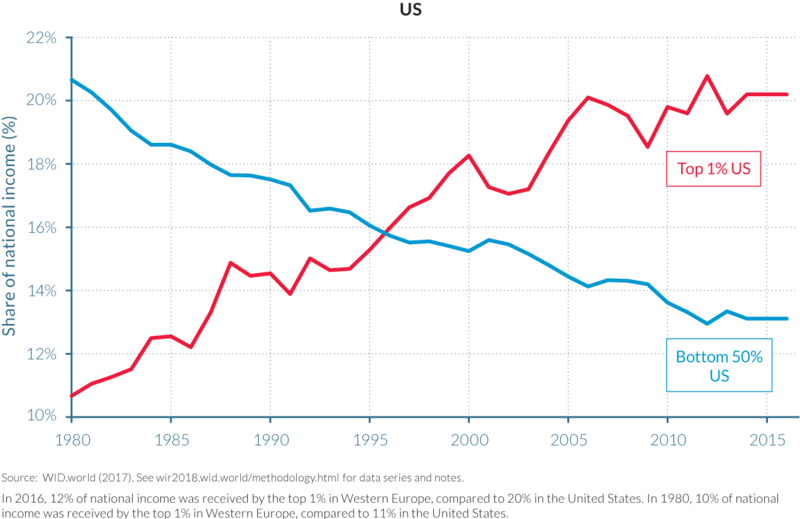 Global income inequality will increase even more if all countries follow the high-inequality trajectory followed by the United States between 1980 and 2016. 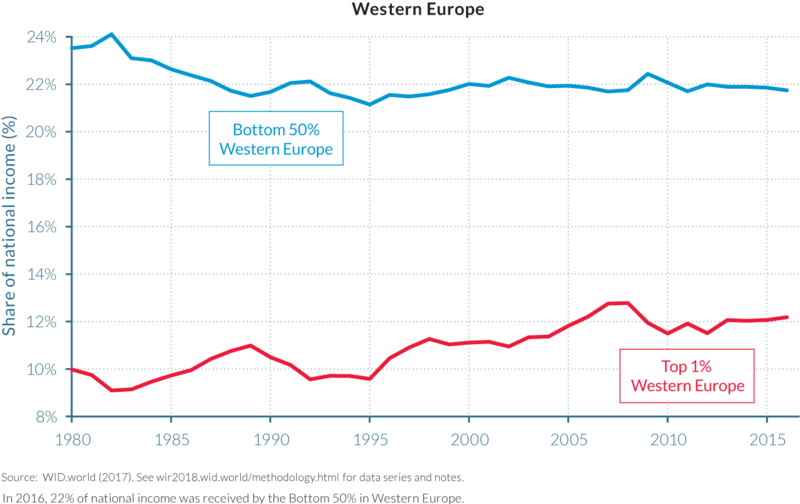 However, global inequality will decrease moderately if all countries follow the inequality trajectory followed by the EU between 1980 and today (Figure E10). Within-country inequality dynamics have a tremendous impact on the eradication of global poverty. 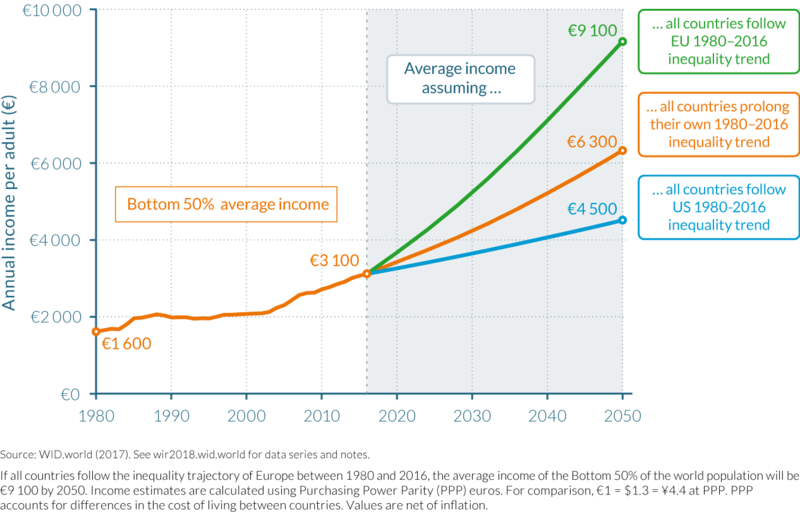 Depending on which inequality trajectory is followed by countries, the incomes of the bottom half of the world population may vary by factor of two by 2050 (Figure E11), ranging from €4 500 to € 9100 per year, per adult. Recent research shows that there can be an enormous gap between the public discourse about equal opportunity and the reality of unequal access to education. In the United States, for instance, out of a hundred children whose parents are among the bottom 10% of income earners, only twenty to thirty go to college. However, that figure reaches ninety when parents are within the top 10% earners. On the positive side, research shows that elite colleges who improve openness to students from poor backgrounds need not compromise their outcomes to do so. In both rich and emerging countries, it might be necessary to set transparent and verifiable objectives—while also changing financing and admission systems—to enable equal access to education. Public investments are needed in education, health, and environmental protection both to tackle existing inequality and to prevent further increases. This is particularly difficult, however, given that governments in rich countries have become poor and largely indebted. Reducing public debt is by no means an easy task, but several options to accomplish it exist—including wealth taxation, debt relief, and inflation— and have been used throughout history when governments were highly indebted, to empower younger generations.